YuMobile owners, Essar Telecom will in March 2014 complete talks to sell a 30% stake to a strategic investor for $100 million (Sh.8.54 billion) in a bid to strengthen the firm’s business in Kenya. According to yuMobile’s CEO Madhur Taneja the firm needs $150 million (Sh.12.8 billion) in the short term to meet its current running cost and capital expenditure. “With the [strategic investor] partner coming on board, the capital [raised] will go a long way towards boosting yuMobile ‘s operations in the country. Priority will be given to widening our footprint and upgrading our network from 2G to 3G which allows for faster data speeds, increasing capacity among other things,” said yuMobile CEO Madhur Taneja. 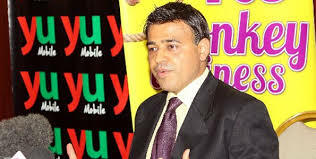 Essar Telecom’s sale of the stake in YuMobile has attracted bids from competitors Safaricom and Airtel. In a new twist in the deal, sources close to the negotiation table reveal that neither buyer wants anything short of a full controlling stake in yuMobile. That means a not-less-than 51% percent stake in the company. It still remains unclear whether the Essar is willing let go of their firm and let a rival run it. The Sh.8.5 billion Essar wants to raise is equivalent to about 30% stake in Yu Mobile, going by its valuation of Sh.24.8 billion at the time of Essar’s entry in 2008. YuMobile has been struggling to break even since 2008 and has been relying on its parent company and loans to run its business. Its performance has been worsened by the on-going price war which has seen airtime prices more than halve since August 2010. “Yu’s demise is a failure of innovation; they have failed to find a killer product to entice customers away from the main operators,” says Peter Wanyonyi a telecoms industry analyst. Even with a potential investor in sight, YuMobile’s facing an uphill task to stay profitable in a mobile market that is dominated by Safaricom. According to Communications Authority of Kenya data, as at September 2013, Orange had a market share of 7.1%, yuMobile was at 8.8%, Airtel Kenya at 17.6% and Safaricom at 66.5%. “The hold Safaricom has on Value Added Service, or VAS, market is virtually absolute with M-Pesa. None of the other operators has been able to even make a name of itself quality-wise, as the [Communications Authority of Kenya’s] quarterly report shows,” observes Mr. Wanyonyi.